New England folklore is wrought with stories of lone travelers who have wandered the highways and bi-ways of the northeast leaving strange tales and mysteries in their wake. Perhaps the most famous case concerns the legend of Peter Rugg, a stubborn man who in 1770 was foolish enough to press on towards his home in Boston instead of wisely seeking shelter as a violent electrical storm approached. As he was about to resume his journey, he is said to have remarked, “Let the storm increase. I will see home tonight in spite of it, or may I never see home!” Rugg’s oath proved prophetic, and for more than a century later countless witnesses throughout New England claimed to have encountered his ghostly apparition riding hard before an approaching storm, always stopping just long enough to ask the way to Boston. Despite the tale being a work of fiction, some 19th century newspapers printed the alleged encounters as fact, thereby giving validity to the legend. Mysteries and legends can be fun to ponder, especially as Halloween approaches. While there are no written accounts of Mr. Rugg ever visiting Smithfield on his eternal journey to Boston, other ill-fated, yet very real travelers passed our way and left a few bizarre tales of their own. A case in point is the story of a wanderer known only as the “Snake Man”. (Nobody knew his real name because he died before he could give it.) His story comes to us through an essay written by Miss Dorothy Whipple in 1929, which was presented by her father, Dr. Lucius A. Whipple, at a meeting of the Western Rhode Island Civic Historical Society on May 24, 1949. The date of the incident is not given, but the story goes that the “Snake Man” appeared at the famed Waterman Tavern one evening carrying a sack which contained his pet rattlesnake. After a few drinks, he announced to those present that his snake could do tricks, and pulled the reptile from its cloth confines and laid it on the bar. As one might guess, the snake bit him, and he died a painful death shortly afterwards. His body was reportedly buried somewhere, “in the wilds of the country”, the location of which has been lost to history, but was apparently still known to some longtime area residents at the time Miss Whipple penned her essay. A ghost story connected with the Waterman Tavern concerns a traveling peddler who mysteriously disappeared while sleeping in the basement because all the upstairs rooms were occupied. As with many ghostly legends the details are vague, but the story relates that it was presumed he had fallen down an open well and drowned. However, it seems odd that nobody would verify this presumption before taking another drink of water! Whether his demise was accidental or by design is not stated. In either case, his physical form was never seen again, but his ghost was said to haunt the place for years afterwards. Then there is the legend of John Noforce, a Narragansett Indian said to have lived in a cave along a rocky cliff off Mann School Road sometime in the 1700s. In 1929, local apple grower T.K. Winsor related the story to a Providence Journal reporter as it had been told to him by his father and grandfather. One day, so the story goes, John was found dead at the base of the cliff, but the circumstances surrounding his untimely demise were a mystery. Some speculated he jumped because of a Romeo and Juliet situation that existed between his tribe and another. A continuation of that story relates that the maiden he was in love with threw herself off the same cliff upon learning of his death. Another version went that John jumped while being pursued by an enemy, choosing death before capture, while others theorized his fall was purely accidental. The rocky precipice where the incident is said to have occurred later became known as “Noforce Rocks”, and was still called such at the time Mr. Winsor gave his interview. Although the exact date of the incident is not recorded, nor is the disposition of John’s remains, historical research conducted by Merrilla Steere in the 1960s, and further research by Laurence J. Sasso Jr. in the 1970s, indicates there is truth to the legend. 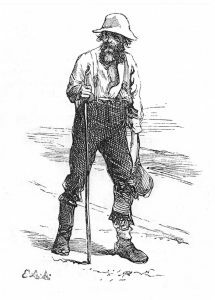 There was a time when tramps, vagabonds, and hobos routinely roamed the country setting camp wherever it suited them; usually out of the prying eyes of the authorities. Smithfield saw its share of these “kings of the road” as evidenced by the following tale which one newspaper headline termed, “an unfortunate occurrence”; which although accurate, definitely understated the entire affair. On March 31, 1873, Albert Barnes of Greenville ventured into the woods behind his home to look for a missing cow and stumbled upon the body of a man. Authorities were notified, but by the time they came to view the scene a heavy rain had begun to fall, so the remains were brought to a store in Greenville. Nobody recognized the man, who was described as being about forty years old, 5’ 10”, 160 lbs., with dark hair and beard. Nothing was found amidst his clothing that would help with identification, but once the clothes were removed, investigators quickly discovered that the man was infected with Smallpox; a highly contagious and often fatal disease of the day! The store was closed to prevent further exposure, and a local undertaker was quickly summoned to remove the body – forthwith – and bury it at town expense. The incident created quite a stir in the community, and before long, someone started the rumor that authorities knew the dead man had been infected with Smallpox prior to his removal from the woods, and thus deliberately risked infecting the entire village. Of course this was not true, and the reasons for initiating such a preposterous rumor can only be speculated at this late date, but perhaps a political enemy of one of the town officials involved with the investigation was the culprit responsible. All who had been exposed to the corpse were vaccinated at town expense, which apparently was enough to stem an outbreak. As to the dead man, he was never identified, and his place of internment also remains a mystery, for although the incident was recorded in the newspaper, there is no mention of the case to be found in town death records! Another mystery was brought to the attention of authorities shortly before Thanksgiving in 1919 when the skeletal remains of an unknown man were found on Wionkhiege Hill about two miles from Farnum Pike. It was estimated the bones had lain there for two or three years. They were given a proper burial at town expense, but neither the man’s identity nor the circumstances surrounding his death were ever established. The true identities of these unfortunate souls will likely forever remain a mystery. The once wooded hillsides where some of these wanderers met their untimely ends are now covered with homes whose occupants have no idea as to what occurred prior to modern development. And these aren’t the only tales that could be told. Now that you’re wondering about the land your home sits on…happy Halloween.